The illegal trade in endangered primates, like the golden-cheeked gibbon, pygmy loris and black-shanked douc langur, is a real problem for conservationists in Vietnam. Local NGO the Endangered Asian Species Trust, or EAST, provides a safe and appropriate environment for the animals’ recovery and rehabilitation. Whenever possible, they are then released back into the wild, where they are carefully monitored. Wildlife Vets International has been helping the centre with remote veterinary advice and hands on practical support and training since 2008. Donate to help us in the fight to save endangered primates from the illegal wildlife trade. Rescuing and rehabilitating primates, then responsibly releasing them to safe area (ensuring no disease risk is introduced to the wild) is a vital part of protecting endangered populations from the $19 billion* illegal wildlife trade. Worldwide trade in illegal wildlife is the fourth most lucrative illegal trade, behind arms, drugs and most recently, people. Vietnam is no exception. Animals are taken for food, traditional medicine, the pet trade and to be part of tourist attractions. The Vietnamese government and local NGOs are working together to strengthen law enforcement in this area, and are gradually making a difference. A key player in this battle is the Endangered Asian Species Trust or EAST. EAST is responsible for running the Dao Tien Endangered Primate Species Centre in Cat Tien National Park in South Vietnam. Situated on a 56-hectare island, the centre specialises in the rescue, rehabilitation and release of endangered primates. The animals brought to them are mostly golden-cheeked gibbons, pygmy loris and douc langurs, all of which are highly endangered. By providing a safe place for confiscated animals to be taken, EAST helps strengthen the capacity of local government to enforce the law. As many as possible of the inhabitants of the centre are eventually released back into the wild. Those few that are not suitable for release, perhaps because of a medical condition or strong habituation to people, are often able to play a very practical role as surrogate parents or role models. Back in the wild, the animals are carefully monitored via radio collars, providing invaluable data which is being used to help the government put together official guidelines for these kinds of reintroduction. Releasing these animals back into the wild not only helps them as individuals, but also helps to boost the wild populations, which are constantly under threat from illegal hunting. Wildlife Vets International has given practical help to the centre, providing on-the-job training to local staff in the process, and currently provides veterinary advice electronically from the UK. As the illegal animal trade continues to flourish in Vietnam, EAST is working hard to provide appropriate facilities and care for primates that are rescued by the authorities. Preparing the animals to be released back into the wild is complex. One of the most important aspects is to make sure there is as little association as possible between the human carers and the food that is provided by them to the primates. One way of doing this is by using automatic pet feeders. Many of the animals coming to the centre require veterinary care. They are often malnourished and may have broken bones or even gun shot wounds. Others are suffering from social deprivation: in some cases, gibbons have lived alone in a cage for up to twenty years. Fortunately, primates have very strong social instincts and are usually eager to interact with others again. Tree-training is an important part of the rehabilitation process, in order to make sure that the animals have the skills to live in the wild. Nearly 30 hectares of the forest on the island are now enclosed, and these areas can be used to help with tree-training for animals that being prepared for release. WVI has been advising EAST since 2008, particularly regarding anaesthesia and breeding control. 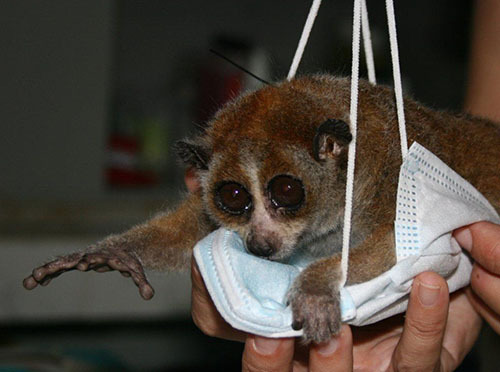 In 2012, we visited the Dau Tien Primate Centre in South Vietnam and were able to give lots of practical help, like anaesthetising lorises and gibbons and even fixing their microscope. We are continuing to advise the centre electronically from the UK. y concerned with is improving the aviaries into which the injured birds are released for rehabilitation. 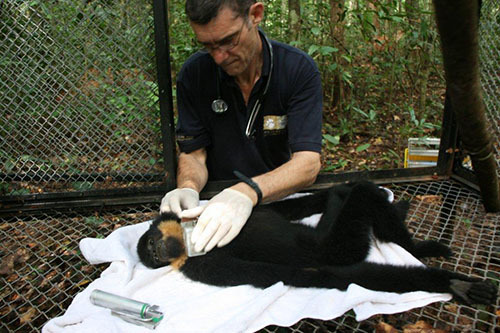 Anaesthetising two female golden-cheeked gibbons so that they could be fitted with temporary contraceptive devices. Sometimes it is necessary to control breeding for animals at the centre, usually just for a short time. Anaesthetising three pygmy lorises so that they could be fitted with radio-collars which would be used to track them after their release back into the wild. Servicing the centre’s microscope, carrying out a post mortem examination on a fatally injured langur and doing an inventory of the centre’s veterinary equipment and medicines. 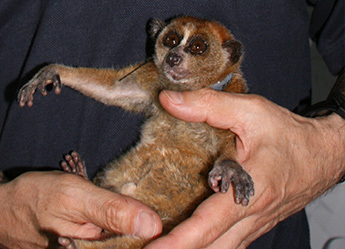 In addition, WVI was able to observe the preparation, release and initial tracking of a group of pygmy lorises. The visit was also a chance to meet with the staff of the centre and of the Cat Tien National Park, as well as with local vets who are involved with the project. The Endangered Asian Species Trust – or EAST - exists to assist governments to stop the illegal wildlife trade, educate people about Asian wildlife conservation, and support responsible and scientifically based rehabilitation of endangered Asian primates. 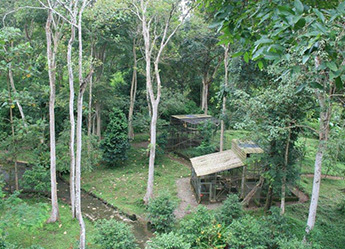 EAST’s primary project is the 57 hectare island Dao Tien Endangered Primate Species Centre in Cat Tien National Park, South Vietnam, where the rescue, rehabilitation and release of endangered primates is put at the heart of national and international efforts in support of Vietnamese primate conservation. Since opening in 2008, black-shanked douc langur (Pygathrix nigripes), pygmy loris (Nycticebus pygmaeus), and golden-cheeked gibbons (Nomascus gabriellae), have been successfully rehabilitated and reintroduced back to the wild. All these species are highly endangered. Wildlife Vets International has been providing general advice to the Dau Tien Centre since 2008, but owing to a lack of familiarity with detailed aspects of the project in Vietnam, it has not previously been possible to help any further. • Meeting with members of the Dau Tien staff, Cat Tien National Park senior staff and local vets involved with the project. The latter included Dr Uli Streicher who has spent many years in Vietnam providing veterinary advise and services to the Endangered Primate Rescue Centre, Cuc Phuong National Park (Northern Vietnam). • Anaesthesia of two female gibbons at Dau Tien to fit temporary contraceptive implants. Whilst in Dau Tien, the reproduction of some individuals has to be controlled for short periods of time. • Travel to Vinh Cuu (forest adjacent to Cat Tien National Park in which EAST releases gibbons and pygmy lorises into suitable habitat). • Recapture of one rehabilitated Golden-cheeked gibbon living free in Vinh Cuu forest. (Radiocollars on gibbons are designed so that they fall off after approx. 6 months. In this case the release mechanism had failed). The recapture was achieved simply by trapping the gibbon in a cage set in the forest. The collar was removed and the gibbon released immediately back into the trees. The gibbon was in good condition, had already bred since its release, and the data from its collar allowed identification of the trees favoured by the family group. This in turn assists identification of future suitable release sites. • Witnessing how the collared pygmy lorises were provisioned for 24hrs in a release cage set in Vinh Cuu, and the subsequent release and initial radiotracking. • Whilst at Dau Tien it was also possible to service the project’s microscope, carry out a post mortem examination of a severely injured Douc, and check through the centre’s veterinary equipment and medicines. All these objectives were met, and WVI is now in a far better position to advise EAST on this interesting and important project into the future. This trip was made possible by funding from Monkeyworld Ltd in the UK. 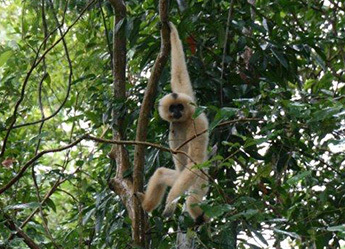 Recapture of one rehabilitated Golden-cheeked gibbon living free in Vinh Cuu forest. (Radiocollars on gibbons are designed so that they fall off after approx. 6 months. In this case the release mechanism had failed). The recapture was achieved simply by trapping the gibbon in a cage set in the forest. The collar was removed and the gibbon released immediately back into the trees. The gibbon was in good condition, had already bred since its release, and the data from its collar allowed identification of the trees favoured by the family group. This in turn assists identification of future suitable release sites.